OTTAWA, April 17, 2019 /CNW/ - The Media Technology Monitor (MTM) is Canada's premier research product in the area of technology ownership and use. With over a decade of data and information available on how adult Canadians (18+) are interacting with media on traditional and new platforms, we are now expanding our service to include young Canadians as well! The new MTM Jr. will focus on the behaviours and activities of Canadians aged 2 to 17 allowing you to better understand the media consumption habits of today's youngest audiences and consumers. A subscription to MTM Jr. will give you full access to data and reports for maximum usability and impact. Cell phone ownership has become commonplace in todays' society, even among younger Canadians. Two in five children (aged 2 to 17) own their own cell phones. Among teens aged 12 to 17, cell phone ownership jumps to nearly 4 in 5. How are children accessing content and does it differ from adults? When kids have "screen time", younger children tend to head for the TV while teens prefer personal devices instead. Among teens, YouTube rivals TV for viewing hours. 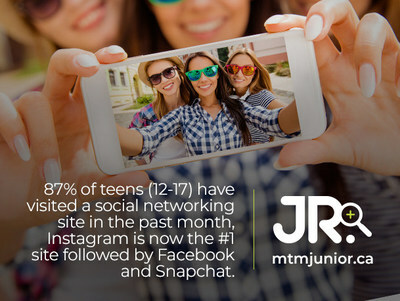 87% of teens between the ages of 12 and 17 have visited a social networking site in the past month, Instagram is now the number one site among teens followed by Facebook and Snapchat. Nearly 6 in 10 Canadian children between the ages of 2 to 17 have used a game console in the past month. MTM Jr. has an incredible year coming up! To find out more please visit our website or contact us if you're interested in learning more about how this unique study could help your business understand the youngest generations of Canadians. View the free infographic here. The Media Technology Monitor (MTM©) is Canada's premier research product in the area of technology ownership and use. Based on 12,000 telephone interviews annually (including a cellphone-only sample), the MTM has spoken with over 140,000 Canadians (equally split between Anglophones and Francophones) over the past decade, making it the most accurate and comprehensive media technology tracking survey of its kind. For more information on the MTM please visit our Portal at www.mtm-otm.ca or call: 1-855-898-4999.